This is an extremely long overdue post, but I have had such a busy year that I really haven’t been able to find much time to write and publish material that I have been meaning to get out. So, as I attempt to get back into the groove, I wanted to publish this quick post of my most recent accomplishment, obtaining the VCP6-DCV certification! I actually completed and obtained this certification back on August 31st, 2017, just a few hours before heading out to take part in and witness the wedding of my beautiful sister. Talk about a stressful day, not to mention the stressful weeks/ends/nights spent trying to cram in as much study to ensure I was well prepared for the exam. I felt very confident in my knowledge and that I would pass the exam on the first attempt and since I was already a VCP5 holder, I chose to take the delta (2V0-621D) exam which I completed in about 90 minutes. I took my time, read every question and diagram thoroughly, and ended up with an impressive 447/500 score! Not too bad if I don’t say so myself. 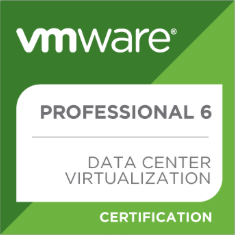 Anyhow, I have now renewed my VCP5, obtained my VCP6, and get to begin my journey’s toward VCP65 and VCAP6x! Can’t wait!!! I’d also like to take a moment to send out congratulations to anyone who has taken and passed a VMware certification this year and best of luck to anyone planning on taking an exam in 2018! Achievement Unlocked! VCP6-DCV! by virtualex is licensed under a Creative Commons Attribution-NonCommercial-ShareAlike 4.0 International License.